so after years of crafting and light gigging at bars and such i'm finally boiling down to record a studio 6 track demo of my strongest songs so i can get out there in the scene and make some noise and as of right now i've saved $70 of the $200 needed for the demo and i'm getting more and more excited about it the closer i get this is actually going to happen!! finally!! Mark was practicing his Flying trying to get his curve right. He was getting frustrated at all the times he had to repeat. He finally landed to the ground, "How can I be the worlds best flyer if I can't even gt my curve right?" he said with a huff. He soon saw you walking by him. His eyes starred at your but it seemed like you didn't even notice. His tongue was out as his wings began to flutter. He snapped out of it as he thought, "Who was that gorgeous mare?..." I hope everyone loves me! I've had "Sunshine and Celery Stalks" by PinkiePieSwear stuck in my head all day. AAALLLLLLLLLL DAY. A natural progression from Flutterwonder the other day. If you like techno/trance they are worth checking out! What other full fledged fan songs (or remixes) are worth checking out? Extra awesome points if they are available for download! 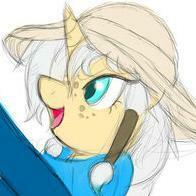 Well howdy doo every pony! About Myself: I'm the number one my little pony fan! Just for one because that's the most important aspect of me. Not really but I LOVE MLP! I also really love role playing and reading/writing. So yeahhhhhh.... I play four instruments and listen to every kind music except for blue grass and I can't wait to RP here!!!!! How I found Canterlot.com: I desperately wanted to role play as a pony.... So I looked it up! How I became a fan of MLP:FiM: My little sister started watching it and I became utterly 100% addicted to the wonderful thing that is my little pony. My favourite main cast pony/s: Twilight Sparkle,Pinkamina Diane Pie I'm so in love with my little pony it isn't funny. 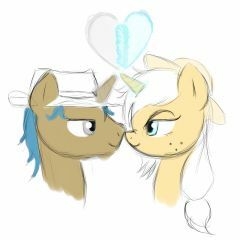 I love Shining Armor and his wife Cadence because they are so amazing. Except she can be really mean sometimes but still she is pretty awesome. I think every little thing about my little pony is perfect and wonderful. It's just oh so wonderful that I can be a part of this amazing roleplay.